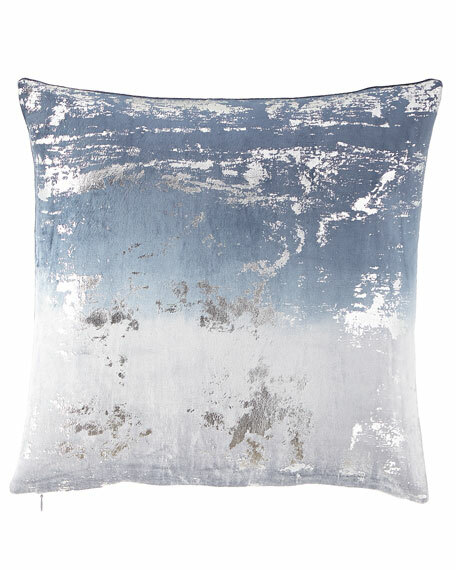 Ombre pillow with metallic detail. Duvet in burnout pattern. 92" x 96". Face: viscose/nylon/silk. Reverse: 300-thread count cotton sateen. Dry clean. Imported. Duvet in burnout pattern. 110" x 96". Face: viscose/nylon/silk. Reverse: 300-thread count cotton sateen. Dry clean. Imported. Sham with burnout pattern. 20" x 30". Face: viscose/nylon/silk. Reverse: 300-thread count cotton sateen. Dry clean. Imported. Woven pillow with flange. Polyester. Machine wash. 16"x 23". Made in the USA of imported materials.